Detainees at the US Guantanamo Bay prison have resorted to assaulting guards with bodily fluids, top marine general John Kelly said at a Senate committee. According to the general, prisoners housed in single cells are usually the ones carrying out the attacks, which aren’t restricted to bodily waste. “We sometimes will have a detainee be very, very cooperative for a long time, and the first opportunity he gets, knees someone in the groin or tries to scratch an eye out,” Kelly said. “Certainly the President wants to close it [Guantanamo] and until that happens, I will take care of those prisoners in a dignified way that sees to their every need,” said Kelly, who is also in charge of the US Defense Department’s defense cooperation. President Obama pledged in 2009 to close Guantanamo, but the US government continues to be an obstacle to the detainees’ lawyers, preventing them from visiting the prison and speak freely with their clients. A total of 122 prisoners remain at the prison, the majority of them without trial or charge. 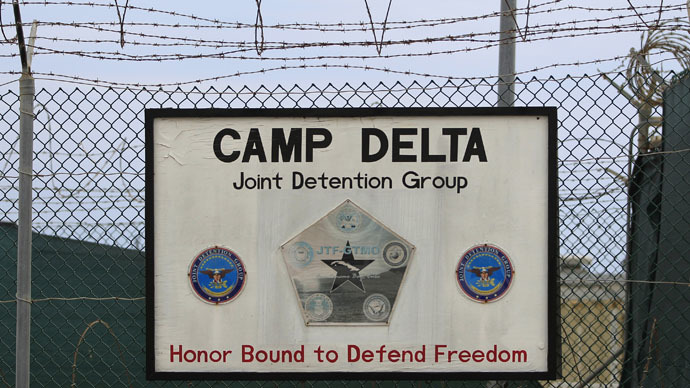 The status of the detainees was to be reviewed in 2009 under an executive order, and the facility eventually shut down. Since then, the number of detainees has nearly halved, but human rights advocates and other observers have been waiting with baited breath for an announcement of a total shutdown. The prison has proven “extremely useful” for the US to house refugees, particularly from Haiti and Cuba, according to Kelly. On Friday, Kelly also announced that some 100 would-be militants from the Caribbean have left to fight with the Islamic State terrorists and could be making their way back to the US. He declined to say when or if the prison would close. He also refused to comment about the prison’s effectiveness. Guantanamo continues to be widely criticized for its inhuman housing conditions; questionable interrogation methods – among them force-feeding, regarded by many as torture; the fact that lawyers can’t gain access to their clients; and the fact that the majority of prisoners still haven’t been charged. Meanwhile, the UN special rapporteur on torture has lashed out at the United States over lawyers’ lack of access to detainees. The rapporteur’s requests to visit US prisons with inmates in solitary confinement have been repeatedly turned down. Juan E. Méndez couldn't get access to Guantanamo since 2004.